As you all know that machete is one of the widely used tools around the world. But many don’t know the interesting machete history that this tool carries with it. Since the beginning of mankind people are using different kinds of surviving tools to save them from wild animals and to collect foods for their family. In their quest for staying alive, they invented new techniques and, designed new tools. Where ever they have gone they needed their tools more than anything as they were wandering in the wilderness. By the span of time, they learned to stay in one place by making a permanent shelter. And they also made an improvement to their tools at the same time. Though the machete we see now is a modern tool, it is an improvised version of the tools that our forefathers used. If we notice very carefully we can see that each machete has a different shape related to the origin of the country. Basically, that is related to that place’s history and culture. You will see that the Latin American machetes are very different than the Nepalese ones. A machete is a broad blade that is used just like a knife or sometimes like a sword. The word macho means sledgehammer in Spanish. Also, it has a different meaning which is manly. All the terms are related to the tool by giving it a complete meaning. The blade of a machete may vary in length but typically lies between 10 to 24 inch. The blade may be straight or curved and variations of thickness are also available. It has a handle which also differs in shape and size according to the origin and blade length. A simple machete is consisted of three basic parts altogether i.e. blade, handle and sheath. The blade is made of carbon steel mainly. Some other metals are also used for it. The handle is made of wood, plastic, rubber and composite materials. The sheath is a vital component of a machete. For making the machete sheath different types of materials are also used. Leather, plastics, and various elastic polymers are widely used for making the nice piece of sheaths. The machete is a true historic tool. This super tool has a large similarity to the falchion of the medieval age. The Falchion was a short sword which was very popular in the thirteenth century and onwards. The edge of that tool was a little curved and wide at the point of the blade. But the other part of the edge had a straight shape. The difference between the falchion and the machete is that the machete doesn’t have a guard and the handle is pretty much simpler than the falchion. Although you may find some machetes with a guard with it which is very uncommon. You may also find similarity with the Kopis of the ancient Greek or the makhaira or the seax of the Germanic tool or the Dao of the Chinese tradition. Also, you may find that the Fascine knife of the European armies from the eighteenth to twentieth centuries somewhat resembles the machete. Machetes are being used in the modern day’s armies also following in the footsteps of the early soldiers. As they need constant field use either in the jungle or in a bushy terrain or in the battlefield, it carries a huge value for them. Machetes have a wide variety of uses all over the world. It can be very handy when you are in the backyard of your house or in an agricultural field or in the jungle. It can also be very effective if you are going for an outing or hiking or camping or simply for fishing. 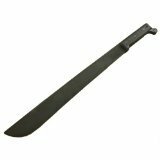 As machetes are found in a wide range of shape and size, you can avail it according to your need. To your astonishment, it can also be used as a weapon. There are many countries in the world where their armies use it for different purposes. Also, there were many uprising events throughout the world where machetes were used as a violent weapon. Machetes have a wide range of uses in agricultural lands. Most of the machetes origin was in a place where agriculture is a common phenomenon. So in those places, they frequently use it for different purposes. There are many tropical and subtropical countries where machetes are used for cutting through the rainforest or sugar cane or simply for cutting big size foodstuffs into many pieces. Sometimes they are used as a cleaver for cutting crude and for making regular type simple handle for others day to day tools. It is a very handy tool for splitting coconuts or for chopping any animal foods or simply clearing brushes in the agricultural field. In some countries, machetes are broadly used for cutting vegetation on a regular basis and also for removing small shaped plants and branches from the fields. Machetes with a back-saw are perfect for this work. In the paddy field, it has a wide range uses for the farmers and people are largely dependent on it for their daily chores. So, in short, it can be said that the machetes are a very utilitarian tool for the large community in agriculture. For cleaning your backyard and keeping it in nice shape, you just can’t deny the use of a machete. To be honest with you, in many countries where the people live in a place full of jungles and trees, they normally have a collection of different categories of machetes for their everyday needs. In their backyard and garden, they use machetes on a regular basis. People need machetes for making wood logs, cutting branches, preparing house needs and for many other reasons. In those regions, people use wood for so many different areas and in their daily necessities, machetes are a life savior. 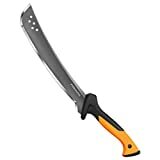 When you are making a fence around your house for protecting your household plants or animals or for simply safety purpose in a wild area, you are so much in need of a machete. When you are clearing your backyard bushes which have grown for the past few months, you certainly can seek the help of a machete. Also when you are in a dire need to cut some wood sticks and make a nice log, you can use a machete. There are literally hundreds of uses of a machete in our daily household works through which we really can be benefitted from. Brush clearing, cutting branches, making trails in the backyard, batoning and what not!! You just name it and there are special machetes for that. If you are an adventurous person, you must be very fond of camping and hiking. For preparing a complete bug out bag for your camping and hiking purpose, you must include a machete as there are no alternatives. In the large wilderness of the jungle, a machete can really help you out. To make a smooth trail clearing in the thick bushes and have a good go, machetes are the best. When you are in the jungle with some friends or with families for camping purpose, you need to collect woods and make a fire. You also need to make a shelter for you as taking all the camping tools may not be always possible. Also, you may have a plan to really try out the natural ways of making a shelter. Whatever may be the plan for you on your camping adventure, having a machete could be the lifesaver for you. To collect the woods for making the fire or preparing for a shelter a machete is a must as knives are too small for that purpose. For batoning of the woods and making your bed with small bushes and soft vegetation, you can easily use a machete. If you are going for an outing for hiking in the mountains through the jungles, you should accompany a machete with you without any doubt. You will constantly need to clear trenches and make your way out for moving forward. A long-bladed machete can solve your problem like a true friend. 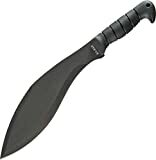 A kukri type machete can be very handy to make small helpful wood branches for mountain climbing also. In your camping and hiking set out, you may face some serious challenges if any wild animals come in your way. A wild bear or regional dangerous animals may be life-threatening for you and your companions. In that dire situations, a machete sword is for protecting you and your friends. There are special types of machetes that can be used in survival situations when you need it. In many parts of the world, a machete is a regular tool for hikers and campers when they are going for an adventure in the wilderness of nature. All in all, it must be in your bug out bag to help you out there in the vast wild areas to undergo a breathtaking journey with your near and dear ones. There are many craftsmen in the tropical and subtropical areas around the world who have their unique abilities to make beautiful wooden doors, windows, beds, chairs, tables, wardrobes and so many other household items. In their toolbox of daily use, they use machetes side by side with many of their typical tools and kits. To process the large wood branches and make a nice piece out of it, a machete can come as a superb tool. As many variations are there to choose a machete as there are different shape and size available for them, they can use any types as they wish to give their work the perfect touch and finish they want. If you need to do your crafty works on your own, you can also use the help of your machetes. Sometimes there is a wide range of wood works done in a home where lots of plants and vegetation are available. In that type of situations machete is a must tool to have. Many parts of the world, there are a lot of houses made from woods. In that case, they need machetes along with their other toolkits. To make large wood branches into small pieces or to shape it in other forms or for batoning purposes, machetes have significant uses. As a whole, it is a tool of great usefulness. There are many militaries around the world where different machetes are widely used for their day to day activities. Whether on the battlefield or in the wilderness of the jungle or simply in the base they reside in, machetes are a very common tool for them. Some armies have their own custom made design which they are using for so many years. 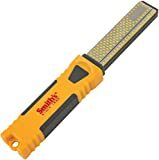 As they go through difficult situations on a regular basis and most of them are in wild areas, they need some survival tool on a permanent basis. And which tool can be more useful in their pursuit of survival other than machetes? To be honest, nothing. Also, they face self-defense scenarios on a daily basis where along with small knives and weapons machetes are pretty much handy for them. In the history of the wars of recent and past times, we can trace back the use of machetes if we dig deep in machete history. When in 1762 in the Battle of Havana Great Britain invaded Cuba, the peasants of the region led guerrilla attacks on the British army with machetes with them. Also, the machete was the symbolic weapon when they started their liberation war in between 1868-1898. From the very medieval age to the modern time’s machetes are found in many army fronts as an important weapon for them. In tropical countries, uprisings are very common scenarios. As machetes are a daily household tool, it is widely used in that chaotic environments throughout the world. If you go through history books you will find so many armies and militias who have used machetes on a large scale for the battlefield and uprising events. Like there is an army named Boricua Popular Army which has an unofficial nickname called Macheteros as they are the machete-wielding farmers of sugar cane fields of past Puerto Rico. In 1994 many of the killings in the Rwandan genocide were done by using machetes. Also, the Interahamwe militias also used it as their primary weapon. Besides, distinctive machete weapon was common for the Haitian Tonton Macoute. The machete is still a very popular sidearm weapon in many African countries. In that region, the world has experienced so many violent incidents where massive killings and tortures were done by this tool. Not only that you will also find that machetes are a very common weapon in the horror films that are made in recent times. It is such a popular weapon that there is a movie named Machete that has 6.6 IMDb ranking. If you are interested in machetes, you have certainly heard the term Zombie Apocalypse. There are a lot of movies made based on that event where machetes are used for slashing the zombie’s heads! So there is another use of your machete! The shape and material are integral parts of a machete. It symbolizes the origin and machete history by which it gets renowned throughout the world. The first famous machete manufacturing company was the Collins & Company from Connecticut for the Latin America and Caribbean region. This company was founded by Samuel W. Collins in 1826 with the goal of making axes. They first started selling their machete commercially in 1845. It was a huge success and afterward, every famous machete was named “Un Collins”. The agricultural cutlass was manufactured by Robert Mole and Sons in the Caribbean region. They were from Birmingham, England, and their machetes was a very good quality tool. There are still many souvenirs that have survived in many collector’s collections. In the early time, products were the best quality and their lasting was very satisfying. With time the quality of the products has deteriorated. But still, many high-quality manufacturing companies are in the market to ensure the value of the products. In the modern era, most blades are made at one go by making it a full tang body and attaching it two parts for handle by wood or plastic or rubber. They are bolted with the handle and sometimes riveted also around the blade. A rough edge is given by the manufacturer and the customers usually sharpen the edges according to their necessity. 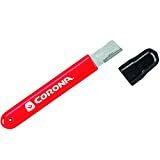 Those machetes are also combined with a hole in the handle to attach the lanyard cord that ensures some extra safety for the users. Also, there are sheaths provided for the products in most of the cases. The shape of the blade determines the shape of the sheath and various marvelous sheaths are made by the manufacturers. A sheath is an integral part of the machetes as it provides safety and sound carrying of a machete. Leather, plastic and various polymers are widely used for making a sheath. The aesthetics of a machete largely depends on the magnificence of its sheath. The toughness of a machete is very important as it undergoes many encounters where huge pressure and impacts are a very common phenomenon. To make these machetes highly useful for taking impacts and hits, most of the manufacturers use a different graded medium to high carbon steels. From 1050 to 1095 grade carbon steel, the latter are the better ones to give you a fine result and also very comfortable for sharpening. Most of the stainless steel machetes are very prone to breaking easily when high impacts are imposed on it. So it would be better to avoid that type when you are looking for long-lasting tools. Like most of the knives, the machetes are also heat treated to such level that offers the maximum toughness. They are tempered well for heavy use and abuse. The ultimate result is that the machete becomes very chipping and breaking resistant and offers the best edge retention attributes. A properly constructed machete will give you the maximum benefit while doing your chores very smoothly. Most of them have a convex or flat bevel starting from the spine to the edge that is made by a secondary bevel. The best of them also have a unique distal taper. There are many countries that produce machete and many of them are exported all over the world. The US, Colombia, China, Nepal, and some other popular machete manufacturing sources are there. Between them, Colombia is the top machete exporter in the world. There are some countries where machetes are embedded in their history very deeply. One of those countries is Angola. If you study their national flag and notice carefully you will see a machete there in their red and black flag. A cogwheel is accompanied by a machete in the flag. There are also some traditional fencing tournaments with the machetes in the Latin American countries like Colombia, Venezuela, and Haiti. In Brazil, machetes are used in the performance of the dance called maculele that is practiced by their native peoples. In Mexico, the machetes are used in a dancing festival where the performers are blindfolded and they vigorously spin it within themselves. For sure, that need a lot of practice and courage to do that! They also use it as a tactical weapon. As machetes are mostly used by adults, in many parts of the world the small ones are taught the safety rules in their day to life from a very early age. They learn to use it in their needs and also the maintenance of a machete. As they largely depend on it in their daily life, they consider it very important to have knowledge of it. Often they accompany their little ones with them when they are out in the wilderness to teach them in the practical environment because that will last long as a memory for them. Machete history certainly has a rich cultural heritage. As different countries have different cultures, their products also reflect that distinction. Due to the origin machetes also carry with it the touch and reflection of that localities. The world famous machetes have the same history of identification of their origin through the unique design. The design of the machete also resembles the natural environment of the countries also. Like the Tsakat is one of the tools used in the southern part of Armenia which is best suited for clearing a large number of blackberry plants abundant in that region. Whereas the Panga or sometimes called Tapanga is widely used in the south and eastern Africa. The name may have an etymological background from the Swahili language but it’s not related to the fish Panga. This blade is about 16 to 18 inches in length and its backside is quite broad. Also, the upper part of the blade may be sharpened which is slightly inclined. People used this tool in many uprising events in Africa where violent activities occurred. The Bolo was invented in the Philippines where this tool is largely used. Its shape is somewhat similar to the Panga but has a swelling belly just before the final tip of the edge. This contour makes it an excellent chopper. There are also some variations available for this design. As usual, this Bolo machete was also used in the revolutions that took place between the Philippines and the Spanish colonial regimes. Also, this tool later became a symbolic weapon between the Philippine and American war. Still today for regular tasks the Filipinos use the tool widely. For clearing large vegetation and chopping the foods and timbers they use it frequently. It is present in their kitchen to do some important works. They also hang it on the wall for decoration purpose. They teach a separate type of martial art with the Bolo that is from their indigenous people. There is also some similar type of tools namely the Parang and the Golok. The Parang is from Malaysia whereas the Golok is from Indonesia. These machetes have some short and thick blades which have a knack for cutting thick vegetation with its primarily grind edge. Also, the Kukri from the Nepalese can be used in the similar type of works. It is suitable for this as it has a curved blade. You will find so many variations if you are in Thailand as they have combined many designs from nearby countries. They are inspired by the designs of Nepal, Laos, China, and some East Asian countries also. Most of their machetes have forward weight and give a nice momentum. Primarily they use it for their farm use and clearing soft vegetation. In the Latin American countries, the machetes are largely used for day to day activities. In the early times, machetes were considered as a manly tool and the male members needed to have a very good hand in handling this tool. There were many machete sword fights between them as a tournament and people showed their skills in that. As a gift or showpiece decorated sheaths were abundant at that time. Today still there are some antiques in that region. It symbolizes their craftsmanship. They also used it to decorate their dresses and wore them in various dance and contests. In fact, it can be an awesome wedding gift too! In Brazil, many machetes were available from the Spanish. It was because they colonized them before. They often use it for farming purpose and for clearing the jungle. Like other countries, they also used it in their own war and battles. It is a part of their culture and origin which carries significant values with it. In their dance competition and martial arts, they as well have wide use of this heritage tool. Like the other parts of the world, the Central American countries are also familiar with the machetes. One thing is common in these cultural variations and that is, wherever there are hills and jungle you will find some form of this universal tool as its competitor is very hard to find. Many people of this region use this tool on a regular basis and they get benefits from it. Not only that, in Russia, you will find one of its type the Taiga which ultimately is a combo of different tools you use in your daily life. Such is the wide varieties available for this historic tool. The machete history can’t be fascinating enough than that described earlier. Throughout the history of mankind, people have invented many tools and techniques in their pursuit of survival. Some have been lost throughout the passage of time and some have survived. Machete is one of this tool that has emerged as a survivor due to its unique attributes. Thanks for the wonderful background information. I have a Collins & Co. – Hartford Legitimus #376 machete, Could you tell me about when it was made, and the worth of the different conditions? Nice to hear from you. We are not getting your query. It would be great if you elaborate your question. Just got the information I was looking for. Keep up the good work.